I spent a few days with my parents last week and of course we went thrift shopping. I was in the store less than two minutes when this sweet book by Tomie dePaola jumped into my hands. It may be the best ten cents I’ve ever spent! Tomie dePaola wrote Strega Nona and Nana Upstairs and Nana Downstairs, two of my favorite books from my days working with children. His illustrations are charming and his stories are sweet and timeless. 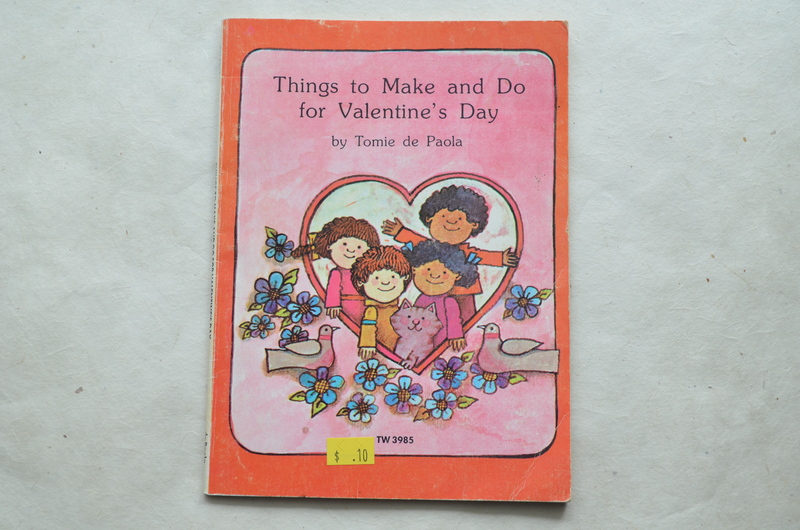 Things to Make and Do for Valentine’s Day is a how-to book with crafts, jokes, tongue twisters, games and recipes to share for the holiday. The book is designed for kids, but I think some of the projects are fun for adults, too. I’m going to try one out this weekend and I will report back next week. If it works out, I may use the idea for my Valentine envelopes this year. Have you planned your Valentine’s Day cards yet? I have my prototype ready…now the real work begins. oh, tomie!!! strega nona was one of my favorite books as a child (i loved many of his works, but that was easily my favorite). his illustrations still call up such happy feelings for me! what a great find – i’m looking forward to seeing what you’ve been inspired to do by the book.